Objective: The aim of this study was to assess the effectiveness and safety of transdermal fentanyl for the treatment of moderate or severe cancer-related pain. Materials and Methods: Electronic databases including PubMed, Embase, the Cochrane Library, Web of Science, Chinese National Knowledge Infrastructure, the Chinese Biomedical Literature Database, and Chongqing Weipu and Wanfang Database were searched for relevant studies published prior to January 2015. Only randomized controlled trials on the use of the transdermal fentanyl patch for the treatment of cancer pain were selected. Two reviewers independently screened the studies and extracted data. The quality assessment of the studies included was based on the Cochrane Handbook for Systematic Reviews of Interventions (version 5.1.0). RevMan 5 (version 5.3) and Trial Sequential Analysis software (TSA, version 2.1, provided by Copenhagen Trial Unit, Denmark) were used for data analyses. Results: A total of 35 studies involving 3406 participants met the inclusion criteria for this meta-analysis. There was no statistically significant difference with regard to the effectiveness of management for cancer pain between the use of transdermal fentanyl patch and oral morphine (risk ratio = 1.00, 95% confidence interval, 0.97–1.03, P > 0.05). TSA results demonstrated that the cumulative Z-score crossed its monitoring boundaries, and therefore, reliable conclusions had been drawn. Moreover compared with oral morphine, the use of transdermal fentanyl patch resulted in statistically significantly decreased incidence of constipation, nausea and vomiting, drowsiness, and urinary retention. There was a significantly greater incidence of skin irritation in patients who used a transdermal fentanyl patch (P < 0.05). Conclusions: The findings from this study demonstrate that use of transdermal fentanyl for the management of moderate or severe cancer pain had more advantages compared to oral morphine. Cancer is a major public health disease that seriously impacts human health. A recent American study  reported that cancer is currently the second-leading cause of death worldwide, and it may replace cardiovascular disease as the first leading cause of death in the future. A survey  showed that about 24–62% of adults with cancer have pain and its related symptoms. Almost all patients with cancer have pain during the process of diagnosis and treatment. The pain could occur at any stages of cancer, and the intensity of pain increases with disease progression. Generally, it has been acknowledged that cancer pain and the side-effects from medications used for pain control reduce the quality of life of in about 70–90% of patients with advanced stages of cancer. Morphine has been historically used for the control of moderate or severe cancer-related pain. A group of pharmacists from Germany first succeed in collecting morphine from opium in 1803. In 1950, a British doctor found that oral morphine had certain effect in the treatment of cancer pain. A guideline of the management of cancer pain published by WHO in 1986 recommended that oral morphine be used for the treatment of severe cancer pain. Although morphine has been used for more than 60 years, an increasing number of publications have reported that use of oral morphine causes significant side-effects such as constipation, urinary retention, and somnolence. Fentanyl is a synthetic opioid receptor agonist. Due to its low molecular weight, highly lipid-solubility, and good skin absorption effects,,, fentanyl is suitable to use transdermally as a patch. Advantages of transdermal fentanyl patch include its ease of use, and its blood concentrations remain high and only drop to 50% after 16 h, when the patch was removed. Recently, it has been used for the treatment of cancer pain., However, some published studies have reported that transdermal fentanyl patch induces potentially serious side-effects, such as skin irritation, and respiratory depression due to the long duration of blood concentration additionally. In recent years, there have been an increasing number of publications that have focused on the use of oral morphine and rebound treatment of moderate or severe cancer pain. This is likely because there is still no consensus about its efficacy. In this study, we conducted a systematic review of literature to assess the effectiveness and safety of transdermal fentanyl patch for the control of moderate or severe cancer pain. This is a systematic review of literature and meta-analysis. A trial sequential analysis (TSA) was carried out on the basis of the preferred reporting items for systematic reviews and meta-analysis (PRISMA) items. All randomized controlled trials (RCTs) with parallel group design comparing the use of the transdermal fentanyl patch with oral morphine for the treatment of cancer pain. Patients with moderate or severe cancer pain, who were treated by transdermal fentanyl patch or oral morphine. The transdermal fentanyl patch was applied to patients with cancer pain. Patients with cancer pain were prescribed the conventional drug (oral morphine). Effectiveness of transdermal fentanyl patch with regard to pain control. The incidence of constipation, nausea and vomiting, drowsiness, urinary retention, and rate of skin irritation. In January 2015, a comprehensive literature search of the following databases was conducted using the following electronic databases: PubMed, Embase, the Cochrane Library, Web of Science, Chinese National Knowledge Infrastructure, the Chinese Biomedical Literature Database (CBM), Wanfang database and Chongqing Weipu (VIP). The literature search was not restricted to year, language, or geographical location of studies. We used combinations of the following keywords and corresponding medical subject headings (MeSH) terms for the literature search, such as “transdermal fentanyl,” “morphine,” and “cancer pain.” The reference lists from the studies retrieved were also reviewed, and relevant studies were checked manually to identify other literature related to our article topic. We reviewed studies that met the following criteria: (1) Type of study: Only prospective RCTs were included. (2) Participants: (i) Cancer patients with moderate to severe pain which were diagnosed through pathology; (ii) cancer patients with no serious cardiovascular and cerebrovascular diseases, respiratory disease, or liver, and kidney dysfunction; (iii) cancer patients with no opioid drug allergies and no history of opioid drug abuse. (3) Intervention: Patients with cancer were randomized either to transdermal fentanyl patch group or to the oral morphine group. (4) Outcomes: (i) Effectiveness, the pain score decreased ≥ 50% was considered valid after the intervention; (ii) adverse reactions, such as constipation, nausea, vomiting, drowsiness, urinary retention, and skin irritation. Excluded criteria: (1) Non-RCTs; (2) incomplete data record for extraction; (3) morphine was delivered via other approach. Two independent reviewers (Wang DD and Ma TT) screened the resulting titles, abstracts, and full texts to identify studies that met our inclusion criteria. Any disagreement was resolved by a third independent reviewer (Peng CB). The following variables were extracted from all studies: Study characteristics ( first author, year of publication, study design, and country), participants' information (sample size, mean age, baseline information). Extracted data were entered into Microsoft Office Excel 2007 and were checked by the third reviewer (Peng CB). The methodological quality of each RCT was assessed using the Cochrane Handbook for Systematic Reviews of Interventions (version 5.1.0 Available from: http://handbook.cochrane.org/). The risk of bias was categorized as either low, high, or unclear. The concepts of losses to follow-up and intention-to-treat were used in assessing incomplete outcome data. Random sequence generation, allocation concealment, blinding of participants, personnel and outcome assessment, incomplete of outcome data, selective reporting, and other bias was independently assessed by Wang DD and Zhu HD. In cases of disagreement, a consensus was reached by discussion. A meta-analysis was performed using RevMan version 5.3 software (provided by The Cochrane Collaboration, visiting ims.cochrane.org/revman/download. to download). Meanwhile, TSA (TSA , provided by Copenhagen Trial Unit, visit http://www.ctu.dk/tsa/downloads.aspx to download) was performed to reduce the risk of random errors. In order to control the risks of random errors due to sparse data and multiplicity, TSA was performed for both the dichotomous outcomes and the continuous outcomes. We adapted a relative risk reduction of 20%, an alpha (type I error) of 5%, a beta (type II error) of 20%, and the diversity of the meta-analysis. Risk ratios (RRs) for discontinuous variables and mean differences (MDs) for continuous outcomes with 95% confidence intervals (95% CIs) were pooled for treatment effects. Standardized MD (SMD) was used when continuous outcomes measured by different scales. When means and SDs were not provided directly in the papers, they were computed from data collected from the authors and/or figures in the articles. Heterogeneity of effect sizes was assessed by Cochran's Q statistic (significance level set at P < 0.10) and the I2 statistic, which is a quantitative measure of consistency across studies. If heterogeneity was present (i.e. 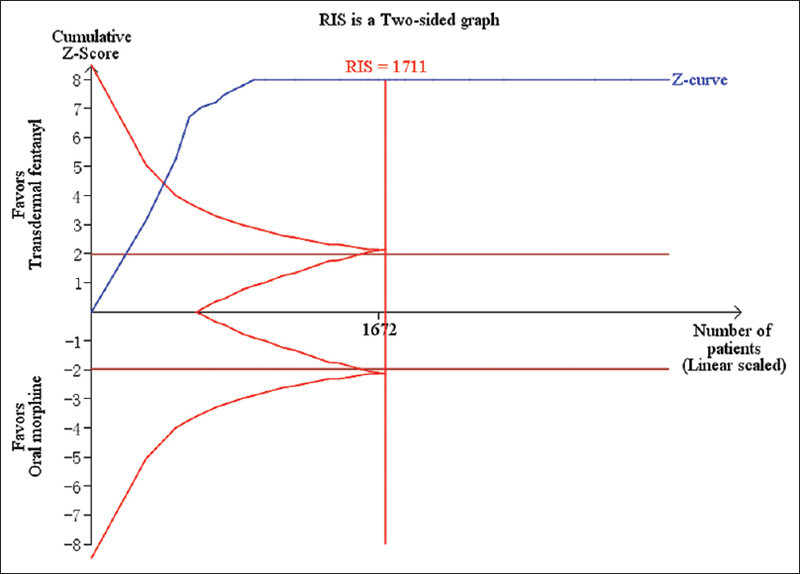 Q test result significant or I2 ≥ 50%), a random effects method was used to estimate a pooled effect size; otherwise, the fixed effects model with inverse variance method was applied. Furthermore, P < 0.05 (two-tailed) was considered statistically significant except for the heterogeneity test, for which P < 0.10 (one-tailed) was used. Funnel plot analysis was performed toward the outcome on effectiveness on transdermal fentanyl to evaluate the risk of publication bias. A total of 35 RCTs with 3406 patients met the inclusion criteria. A list of the comprehensive characteristics of the studies included is shown in [Table 1]. Of the 35 included studies, only three ,, reported the methods of randomization, and none of them reported the allocation concealment methods. Four studies ,,, reported that blinding was not used, and the other studies did not mention this at all [Figure 2]. Twenty-nine studies ,,,,,,,,,,,,,,,,,,,,,,,,,,,, involving 2769 patients reported the effectiveness of the use of transdermal fentanyl patch for the control of moderate or severe cancer pain. There was no heterogeneity (I2 = 0%, P= 1.00), and therefore, the fixed-effects model was applied. The results of meta-analysis showed that transdermal fentanyl had similar pain control effects when compared with oral chemotherapy morphine (RR = 1.00, 95% CI, 0.97–1.03, P= 0.99) [Figure 2]. 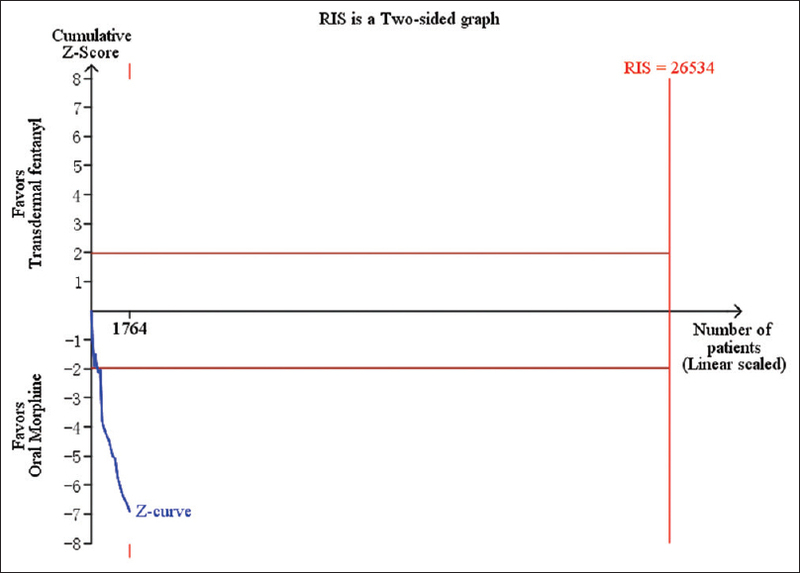 The cumulative Z-curve crossed the monitoring boundary after five trials published according to TSA [Figure 3]. The secondary outcomes included of side-effects such as the incidence of constipation, nausea and vomiting, drowsiness, urinary retention, and skin irritation. The detailed results are shown in [Table 2]. Thirty-five studies ,,,,,,,,,,,,,,,,,,,,,,,,,,,,,,,,,, involving 3406 patients reported the incidence of constipation. The pooled RR for the incidence of constipation on cancer patients was 0.39 (95% CI, 0.35–0.44, P < 0.00001) with moderate heterogeneity (I2 = 39%, P= 0.01). 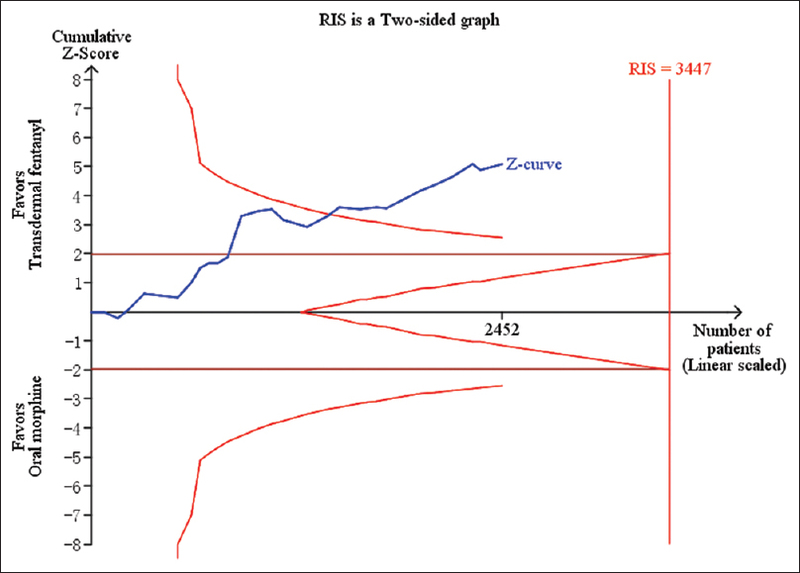 The results of TSA illustrated that cumulative Z-curve had crossed the monitoring boundary and required information size (RIS) and the statistical result had been steady [Figure 4a]. Thirty-one studies ,,,,,,,,,,,,,,,,,,,,,,,,,,,,,, involving 2929 patients reported the rate of nausea and vomiting; using a random-effects model (I2 = 51%, P < 0.0006), the results of meta-analysis demonstrated a significantly reduced incidence of nausea and vomiting in patients in whom a transdermal fentanyl patch was used (RR = 0.54, 95% CI, 0.45–0.64, P < 0.00001). 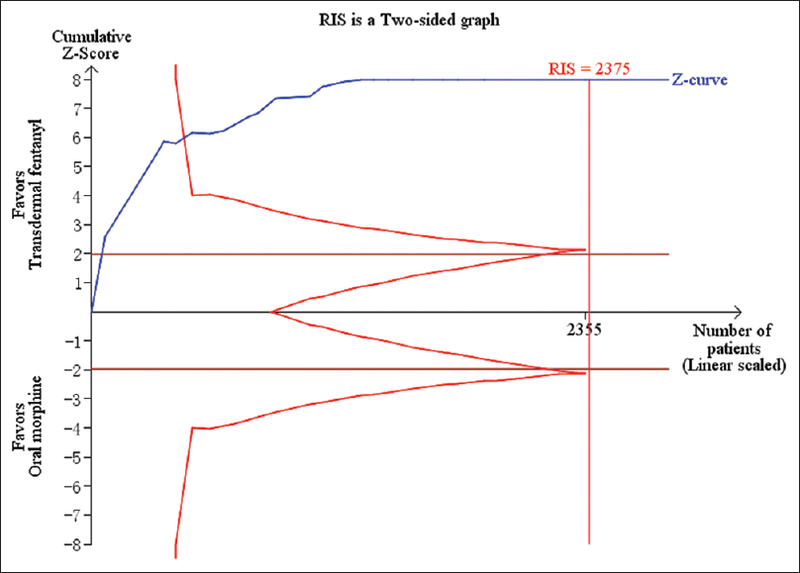 TSA showed that the cumulative Z-curve had crossed the monitoring boundary, and RIS and the statistical result had been steady [Figure 4b]. Twenty-eight studies ,,,,,,,,,,,,,,,,,,,,,,,,,,, involving 2548 patients reported the incidence of drowsiness. There was low heterogeneity in included studies (I2 = 18%, P= 0.19). The pooled RR demonstrated a statistically significant reduced incidence of drowsiness in patients given the transdermal fentanyl compared to those given oral morphine (RR = 0.67, 95% CI, 0.58–0.78, P < 0.00001). 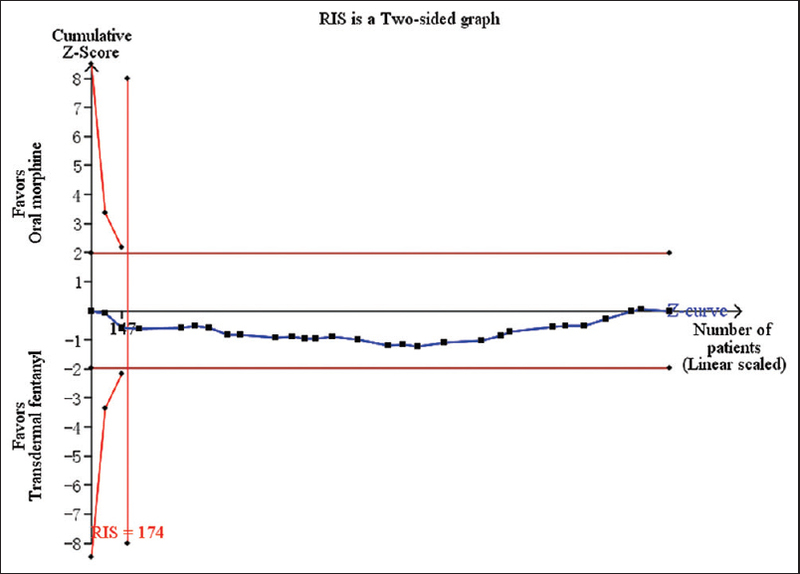 TSA showed that this statistical result had been steady since Z-curve had crossed the monitoring boundary [Figure 4c]. Twenty-four studies ,,,,,,,,,,,,,,,,,,,,,,, involving 2157 patients reported the incidence of urinary retention. The pooled RR for the incidence of urinary retention on cancer patients was 0.37 (95% CI, 0.28–0.50, P < 0.00001) with no heterogeneity (I2 = 0%, P= 0.95). 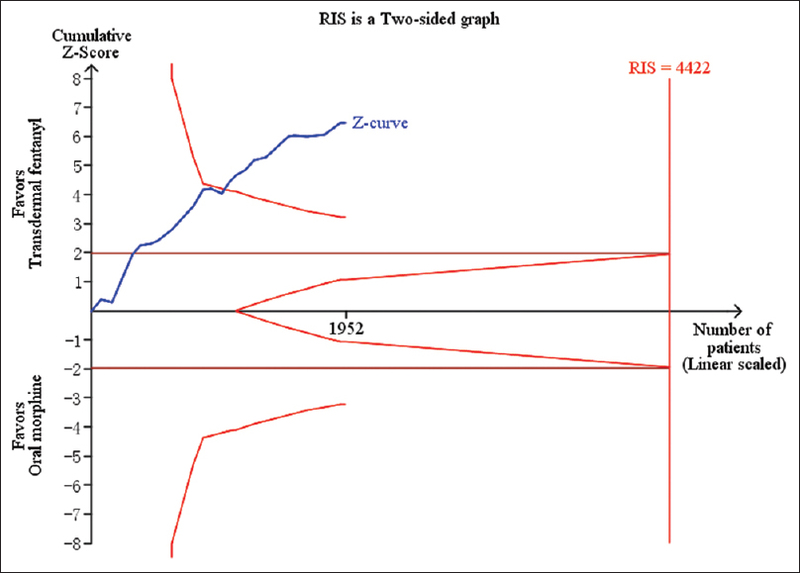 Moreover, TSA result showed that Z-curve had also crossed the monitoring boundary which meant this result had been steady statistically [Figure 4d]. Twenty-one studies ,,,,,,,,,,,,,,,,,,,, involving 1913 patients reported the incidence of skin irritation. 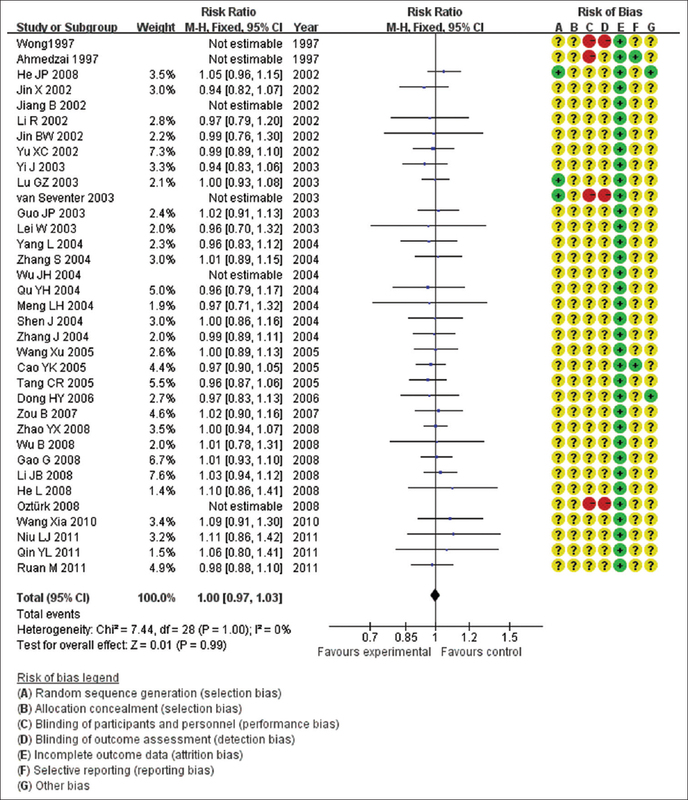 The result of meta-analysis illustrated that there was no heterogeneity among including studies (I2 = 0%, P= 0.56). Moreover, it also showed that compared with oral morphine, the transdermal fentanyl patch had disadvantages in the incidence of skin irritation, and this difference was statistically significant (RR = 3.86, 95% CI, 2.65–5.63, P < 0.00001). However, because of the low incidence in the control group (oral morphine), the TSA result showed that Z-curve failed to cross the monitoring boundary, and the statistical result still had not been steady [Figure 4e]. 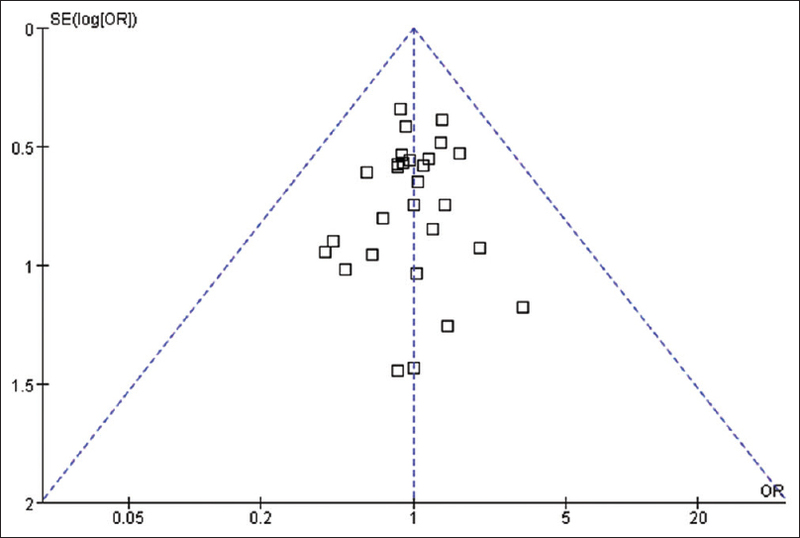 Funnel plot analysis was performed, and the results showed an unsymmetrical funnel plot. This indicates a risk of publication bias. The funnel plot on the outcome of effectiveness on transdermal fentanyl is shown in [Figure 5]. Pain is one of the most feared consequences of cancer, which significantly impacts the quality of life of cancer patients. It has been reported that transdermal fentanyl patch and oral morphine are effective for the treatment of cancer pain,, and are regarded as the first-line drug for the managements of chronic moderate or severe cancer pain. The results of this meta-analysis and TSA show that transdermal fentanyl patch and oral morphine provided similar analgesia effects, and transdermal fentanyl patch significantly reduced the incidence of constipation, nausea and vomiting, drowsiness, and urinary retention. All of the cumulative sample sizes crossed the monitoring boundary, and the statistical results had been steady. However, use of the transdermal fentanyl patch resulted in a significantly increased incidence of skin irritation. Currently, an increasing number of the clinical studies concentrating on fentanyl transdermal and oral morphine for the treatment of moderate or severe cancer pain have been published.,, However, most of them have low methodological quality and consist of small sample sizes which are obviously difficult to guide clinical practice. In this study, we strictly evaluated the pros and cons of the use of fentanyl transdermal. Importantly, our results were consistent with the findings reported in previous meta-analyses.,, In addition, the study of Hadley G also reported that fentanyl transdermal patch could improve the effectiveness of the management of cancer pain, as well as the outcomes of the incidence of constipation, nausea, vomiting, and other side-effects. 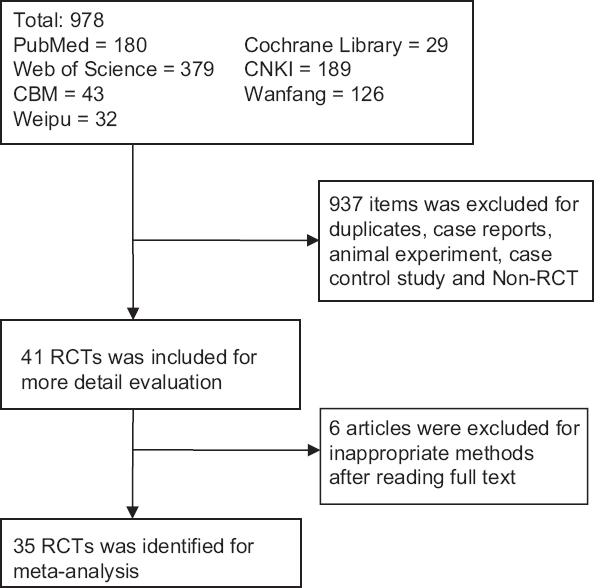 Despite strictly following the guidelines of the Cochrane systematic reviews, conducting a comprehensive literature search, and independently performing data extraction, there are limitations of this meta-analysis. These limitations include studies were consisting of low methodological quality included thereby limiting the credibility and extrapolations of our findings. Based on the findings of this meta-analysis, we conclude that compared with oral morphine, fentanyl transdermal patch equally controls cancer pain, however, the fentanyl transdermal patch has fewer side-effects (with the exception of the incidence of skin rash and irritation). Given the limitations of this meta-analysis and the lack of relevant economic evaluation, this evidence should be used cautiously when guiding clinical practice. More rigorous and large-scale RCTs, whose reports of clinical study should be in accordance with the CONSORT statement strictly  and outcomes on adverse reactions should be specifically concerned, in order to provide stronger clinical evidence for the clinicians. Siegel RL, Miller KD, Jemal A. Cancer statistics, 2015. CA Cancer J Clin 2015;65:5-29. Cleary JF. The pharmacologic management of cancer pain. J Palliat Med 2007;10:1369-94. Portenoy RK, Lesage P. Management of cancer pain. Lancet 1999;353:1695-700. Wiffen PJ, Wee B, Moore RA. Oral morphine for cancer pain. Cochrane Database Syst Rev 2013 22;7:CD003868. World Health Organization. Cancer Pain Relief. Geneva: WHO; 1986. Cachia E, Ahmedzai SH. Transdermal opioids for cancer pain. Curr Opin Support Palliat Care 2011;5:15-9. Jeal W, Benfield P. Transdermal fentanyl. A review of its pharmacological properties and therapeutic efficacy in pain control. Drugs 1997;53:109-38. Muijsers RB, Wagstaff AJ. Transdermal fentanyl: An updated review of its pharmacological properties and therapeutic efficacy in chronic cancer pain control. Drugs 2001;61:2289-307. Lehmann KA, Zech D. Transdermal fentanyl: Clinical pharmacology. J Pain Symptom Manage 1992;7 3 Suppl: S8-16. Kornick CA, Santiago-Palma J, Moryl N, Payne R, Obbens EA. Benefit-risk assessment of transdermal fentanyl for the treatment of chronic pain. Drug Saf 2003;26:951-73. Moher D, Liberati A, Tetzlaff J, Altman DG; PRISMA Group. Preferred reporting items for systematic reviews and meta-analyses: The PRISMA statement. Int J Surg 2010;8:336-41. Unit CT. TSA-Trial Sequential Analysis. Available from: http://www.ctu.dk/tsa/. [Last accessed on 2013 Mar 13]. Thorlund K, Engstrøm J, Wetterslev J, Brok J, Imberger G. User Manual for Trial Sequential Analysis (TSA). Copenhagen Trial Unit. Available from: http://www.ctudk/tsa/files/tsa_manualpdf. [Last accessed on 2011 Mar]. Brok J, Thorlund K, Gluud C, Wetterslev J. Trial sequential analysis reveals insufficient information size and potentially false positive results in many meta-analyses. J Clin Epidemiol 2008;61:763-9. Wetterslev J, Thorlund K, Brok J, Gluud C. Estimating required information size by quantifying diversity in random-effects model meta-analyses. BMC Med Res Methodol 2009;9:86. Ahmedzai S, Brooks D. Transdermal fentanyl versus sustained-release oral morphine in cancer pain: Preference, efficacy, and quality of life. The TTS-Fentanyl Comparative Trial Group. J Pain Symptom Manage 1997;13:254-61. Wong JO, Chiu GL, Tsao CJ, Chang CL. Comparison of oral controlled-release morphine with transdermal fentanyl in terminal cancer pain. Acta Anaesthesiol Sin 1997;35:25-32. He JP, Yu ZY, Zhu XQ, Yan X, Ren L, Yi C, et al. Clinical research of transdermal fentanyl for patients with cancer pain. Chin J Clin Oncol 2002;29:67-8. Jiang B, Wang M, Wang Y. A comparison between transdermal fentanyl and oral morphine in the treatment of cancer pain. Chin J Clin Oncol Rehabil 2002;9:121-2. Jin BW, Zhou CC, Zhang J, Li DR, Lv MJ, Lu B. The clinical use of transdermal fentanyl in treatment of cancer pain of lung cancer. J Clin Pulm Med 2002;7:38-9. Jin X, Ma L, Liu C. Transdermal fentanyl vurse sustained-released oral morphine for moderate to severe cancer pain: A clinical trial. Chin J Clin Oncol 2002;29:69-70. Li R, Zhao GJ, Shen H, Du SJ. Clinical observation of morphine vs. transdemal fentany for cancer pain. Clin Med Chin 2002;18:89-90. Yu XC. The efficacy of transdemal fentany for management of moderate to severe cancer pain. Acta Acad Med Jiangxi 2002;42:124.
van Seventer R, Smit JM, Schipper RM, Wicks MA, Zuurmond WW. Comparison of TTS-fentanyl with sustained-release oral morphine in the treatment of patients not using opioids for mild-to-moderate pain. Curr Med Res Opin 2003;19:457-69. Guo JP. Transdemal fentany vurse sustained-released oral morphine for cancer pain: A clinical research of 63 patients. Acta Acad Med Nantong 2003;23:200-2. Lei W, Liu XG, Liang J. Transdemal fentany vurse sustained-released oral morphine for management of cancer pain: A clinical research of 67 patients. Chin Clin Onco 2003;8:136-7. Lu GZ. Clinical observation of transdermal fentanyl for advanced cancer pain. Int Med Health Guidance 2003;9:35-6. Yi J, Cai Y, Li Y, Li D. Sustained-released oral morphine vurse Transdemal fentany for cancer pain control from advanced cancer patients: A clinical research. J Modern Clin Med Bioeng 2003;9:332-3. Meng LH. Transdemal fentany for treatment of moderate and severe cancer pain: A clinical study. Chin J Med 2004;4:425-6. Qu YH. 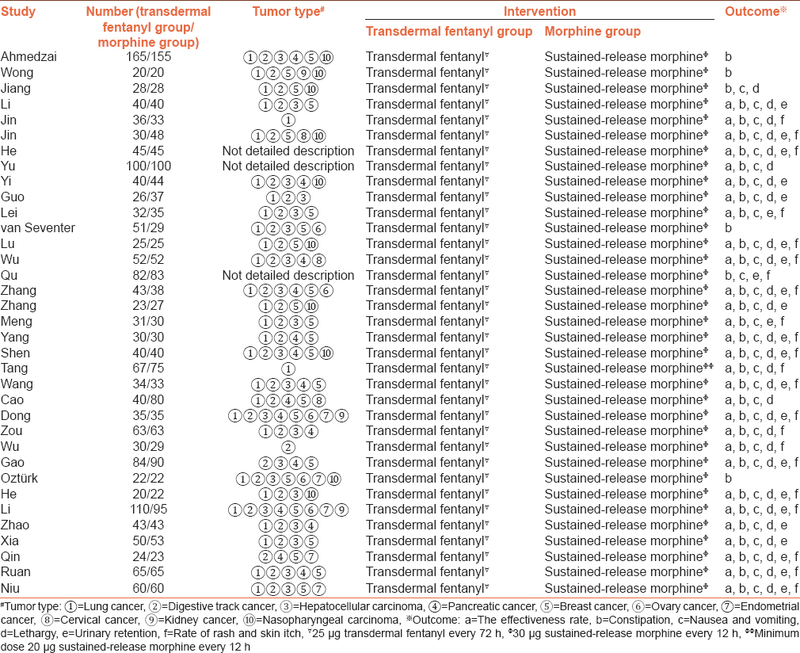 Compared between transdermal fentanyl and morphine in the treatment of cancer pain. J Jinzhou Med Coll 2004;25:80. Shen J, Du LL, Zhang GQ, Wang P, Yu XL, Yin Z, et al. The efficacy of fentanyl strapping for pain in advanced cancer. Med J Qilu 2004;19:511-2+4. Wu JH, Liu HJ, Wu Y. The efficacy of transdemal fentany for management of cancer pain of advanced hepatocellular carcinoma. J Med Theory Pract 2004;14:1132-3. Yang L, Wang YF. Clinical observation of duragesic and controlled-released morphine sulfate in treatment of cancer pain. Mod Oncol 2004;12:563-5. Zhang J. Clinical observation of transdemal fentany for cancer pain. Clin Focus 2004;19:101-2. Zhang S, Liu B, Qian X. Transdermal fentanyl vurse morphine in the treatment of moderate to severe cancer pain: A clinical trial. J Southeast Univ (Med Sci Edi) 2004;23:317-9. Cao YK, Zhang Y. Clinical observation of transdemal fentany and morphine controlled-release tablets in patient with cancer pain. Clin Med J 2005;3:50-2. Tang CR, Li FW. Transdemal fentany vurse sustained-released oral morphine for moderate to severe cancer pain. Chin J Cancer Prev Theat 2005;12:479-80. Wang XU, Tong ZS, Li SF, Shi YH. Clinical evaluation of efficacy and side effects of transdermal fentanyl and sustained release morphine treatment of moderate-severe chronic cancer-related pain. J Tianjin Med Univ 2005;11:586-9. Dong HY, Chen GY, Li XL. Transdemal fentany vurse sustained-released oral morphine for cancer pain: A clinical study of 70 patients. J Chin Physician 2006;8:1430-1. Zou B, Huang Z, Xie Q, Zhao D, Wang L. Clinical efficacy and life quality of transdermal fentanyl in the treatment of cancer pain. Cancer Res Prev Treat 2007;34:207-8. Oztürk T, Karadibak K, Catal D, Cakan A, Tugsavul F, Cirak K. Comparison of TD-fentanyl with sustained-release morphine in the pain treatment of patients with lung cancer. Agri 2008;20:20-5. Gao G. The efficacy of transdemal fentany vurse sustained-released oral morphine for cancer pain. Proc Clin Med J 2008;17:755-6. He L, Hou M. A clinical study between transdemal fentany and sustained-released oral morphine in the management of cancer. West Chin Med J 2008;23:308-9. Li JB, Lin BJ. Transdemal fentany for cancer pain of advanced stage cancer patients: A clinical study. Jiangxi Med J 2008;43:569-71. Wu B, Zhao S. Transdemal fentany for cancer pain of primary hepatocellular carcinoma: A clinical trial. J Med Theory Pract 2008;21:667-8. Zhao YX, Huang LJ. A comparision between transdemal fentany and oral controlled-released morphine in the treatment of moderate and severe cancer pain in elderly patients. J Clin Exp Med 2008;7:31-2. Xia W, Ruxian W, Patiguli A, Han J. Clinical evaluation of FTS and OCSM in the treatment of cancer patients with moderate and severe cancer related pain. J Xinjiang Med Univ 2010;33:1248-50+53. Niu LJ, Li T, Sun HM, Niu HJ, Niu AQ. A comparison between transdermal fentanyl and controlled-release morphine in the treatment of cancer pain in elderly patients J Clin Anesthesiol 2011;27:984-5. Qin YL. Clinical study of transdermal fentanyl for moderate to severe cancer pain. Clin J Phamacopidemiol 2011;20:397-9. Ruan M. A compared between controlled-release morphine and transdermal fentanyl in the treatment of cancer pain. Chin Med Herald 2011;8:117-9. Clark AJ, Ahmedzai SH, Allan LG, Camacho F, Horbay GL, Richarz U, et al. Efficacy and safety of transdermal fentanyl and sustained-release oral morphine in patients with cancer and chronic non-cancer pain. Curr Med Res Opin 2004;20:1419-28. Yang Q, Chen DL, Bi ZF, Guo SS, Jiang ZM, Xie DR. Fentanyl transdermal or sustained-release oral morphine in the treatment of Chinese with moderate-to-severe cancer pain: A meta-analysis of RCTs. Chin Clin Oncol 2008;13:109-14. Guo JB, Wei LP, Wang YM. Transdemal fentany vurse oral morphine for management of moderate to severe cancer pain in China: A meta-analysis. Chin J Health Stat 2010;17:385-7. Hadley G, Derry S, Moore RA, Wiffen PJ. Transdermal fentanyl for cancer pain. Cochrane Database Syst Rev 2013;10:CD010270. Bian ZX, Shang HC. CONSORT 2010 statement: Updated guidelines for reporting parallel group randomized trials. Ann Intern Med 2011;154:290-1.